Fusion Reiki was introduced by Dr. Jason Storm in the year 2000. It was during a group attunement Dr. Jason received the symbol and the instruction for its use. The symbol was given the name “Fusion” as it was a combination of Usui, Seichim, Karuna Reiki and Chi Gong. I have used this symbol right from my First degree Reiki. It works just as well with other Reiki symbols as it does on its own. The Fusion Reiki Symbol is a very powerful symbol as it’s a combination of different energies. Once attuned to the symbol , I have noticed the Reiki frequency becomes higher and flows better. Fusion Reiki works best when used for distance healing; the energy flow is not the same when used for direct healing. It works very well on multiple intentions like our Reiki Box. How to Activate the FR Symbol ? Chant its name thrice or draw or visualize it on the Reiki Box or the person you are sending healing to. Fusion works very quickly compared to other symbols because of mixed energies and people connect easily with this symbol. There is no correct way of drawing the symbol. Any stroke can be drawn first (let your intuition guide you!). The Fusion has a consciousness of its own and can also be used for healing, meditation etc. How to Attune to the Symbol? Self attunement works best in Fusion Reiki. We need to get meditative for 15 – 20 minutes. If required put on some light meditative or healing music. Take 3 deep breaths and say “I would like to get myself attuned to Fusion Reiki” thrice. Stare at the symbol for 10 minutes or so till the time you have absorbed each and every stroke of the symbol. You might feel light headed or feel some tingling sensation all over your body; it is the energy entering your body. Once you think you have “absorbed” the symbol, take a pen and a piece of paper and start drawing the symbol without looking at it. Don’t worry your intuition will guide you to draw the symbol. Draw the symbol 6 times and now you are attuned to the Fusion Symbol. You can use the symbol any place and anywhere, you will be surprised how fast and effectively it works. It can help you in getting rid of pain , to move traffic or anything which is for the greatest and the highest good of everyone. Dear sunetra..thank u very much for the symbol and its uses..i have learnt it and attune myself to it today..thank u reikirays for posting such informative useful and easy to learn articles..one thing I have to ask..how to pay the gratitude for getting this information to the reiki rays site and to the master who is sharing it with us. Dear Sunetra, I had come across Fusion Reiki last year and did a self attunement, this was before I had my Usui reiki attunement done. I had immediatly sensed the energies of the symbol and was using it in healing since last year. I think I should now reattune myself to it again as after my usui reiki attunement.., I felt a difference in my energies. Thank you for this article as I was wondering why so few articles on Fusion Reiki. Glad you are enjoying Fusion Reiki! Do you have any proper manual or the proper att. process of Fusion Reiki, as of now I am self attuned, We are really interested in the background as its a combination of so many energies. Could you please guide me with few doubts. Can I use this symbol for direct selftreatment and full body treatment. Can I use this symbol along with other symbols everytime. I’m a 2nd level practioner.. 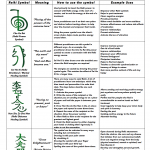 Thank you very much for this wonderful info on Fusion Reiki Symbol… I am a 2nd degree Reiki practitioner.. I chant the Hon Sha Ze Sho Nen, Cho Ku Rei, and Sei He Ki everytime I use these Symbols.. What do I chant as I draw/visualize this Fusion Reiki symbol? No you dont have to attune urself everyday….just attune urself once and keep practicing. Tthanks a ton and gratitude to u for intorducing me to fusion reiki. I have attuned myself and to my class that i took recenlty. The attunement was amazing.the symbol is so powerful. I have included it in my daily REIKI. Full of gratitude towards you. Please keep on sharing the knowledge.GOD Bless You. Thank you Sunetra. I will try. The Fusion symbol is a combination of 3 symbols, each from a different energy of healing.CHK symbol has been taken from Usui Reiki,helps in protecting,grounding and activation. Heart symbol (Kite shaped and 3 balls) from Karuna Reiki its for mental and emotional healing, past life,child hood trauma,addictions. The petal sign is Hi Lo God from Seichem its the spiritual symbol which connects he person to god above and mother earth below. i was attuned 3rd degree in 2000..and feel complete with reiki forever. this symbol can take me to a different level and am sure going to attune to it. please clarify- the name is Fusion Reiki symbol. is the same to be used while starting attunement? I have tried to attune myself today. completed the procedure as mentioned here. had lots of hand movements- on their own. Ffeeling was not much different from a regular self healing process. but hope i feel the goodness of this new attunement soon. Do share how do you feel when you keep practicing it regularly. I want to know how to heal gallstones with out any surgery with Reiki. Generally doctors advice to remove gallbladder. You can try removing of the gall bladder stones with the help of Psychic Surgery, apart from the regular healing. peace be with you, may you be happy and may you be filled with loving kindness. i happened upon this article by chance, and am using it for my clients before they see me tonight. Thanks. Thank You Tom for your wishes, I am really happy you are using this symbol for your clients. Please do share your experience with us. Good going dear try alimentals energy to make more symbols. Thank you for the symbol, thank you for sharing. Will attune tonight and share my experience. I have a question for you. Would you mind to tell me that Reiki practice can help to get rid of gallstone? Yes one can heal gall stones by using Reiki. thank you for your information about this new symbol. I have never heard this before here in Italy. I’m a Master Reiki (Usui), and I would be really interested in knowing more about this symbol, that I could teach during my next 2nd level class. – I would like to know how I can be attune to this news symbol.. Do I need a Master person who can active me or may I do it by myself? – Is there a guide, a book about Fusion Reiki? – Is there a page where is shown how to draw exactly this symobol? Thank you in advance for your kind reply and from the deep of my heart. As mentioned in the above article, this symbol can be self attuned. I have not found any guide book regarding the symbol, but you can always google!!! The method of drawing will depend upon your intuition! A small tip can be pray to Reiki to give you guidance how to draw the symbol, take a deep breath and exhale. Once your mind is relaxed start drawing the symbol, you will know what works best for you!! could u plz tell me the mantra of this symbol ? I am a bit confuse to use it . Please do share your experience with us regarding Fusion! Can you please tell me the attunement process and how to use the FUSION symbol, in detail??? Do we follow any steps while drawing this symbol? I would like to experience Reiki, could u help me to do so. I learnt upto 3degree reiki.i use to send reiki to my son daily studying in boarding.till today i practise with all the mastersymbols but can i use this fusion symbol too in sending him energy for his coming exams.. I would like to know if you have written any books and if so could you highly recommend one of your books. I would like to read more about reiki to enhance in this area ,I also practice Reiki. TQVVVM Greatly appreciate yr sharing. I hv completed Level 4 n now doing mastery class. May I know if I can include yr Fusion symbol to all my other 7 to 10 symbols tat I m using without any setback? Is it applicable tat the more symbols u use, the better? Love n gratitude to u. This is a wrong notion among people that more the number of symbols, better will be the flow and faster will be the manifestation. You can use just one symbol and suffice!! In the end intention matters. I am attuned only to Level 1 reiki.Can i still attempt fusion Reiki? Thanks a lot for sharing such a wonderful thing. Thanks for ths symbol ,i have done reiki masters, basically we are into Ayurveda, and we have over 200 students in Europe – and if it sounds good to you then we can work together- please email me-! Thanx.how can I contact you for plr.please send ur contact details. Plz give me your email I’d. Thanks for calling and exchange of emails – i will get in touch with you as soon as i have something for Mumbai ! Im truly Amazed. It obviously resonates with me. My hands have not felt this hot and Energetic in a long time. .. I love working with fusion. It’s subtle, but powerful, it’s intelligent. Best for distance, self protection and manifestation. However pl let me know how do you meditate on a symbol? Hi Sunetra , I am 2nd degree Reiki channel. Can I also use Fusion symbol? If I use what is the mantra to chant 3 times after applying Fusion symbol? Should I say Fusion 3 times? Please help me. Thank you. Thanks so much for this wonderful symbol.. sunettra do you have a website. I would like to take some training with you.. Previous post: What’s on the Other Side of Your Fear?